I don’t like altering clothes. I like to sew new ones and I have no problems with fixing a lost button or a broken zipper. But I don’t anymore buy things to remodel them. I used to do but somehow it never turned out how I wanted it and was always a lot more work than expected. Additionally, I don’t like to alter old clothes. I mean, these things have survived 40 or 60 years without manipulation and I know how valuable unaltered things from previous centuries are for costume historians because they are so rare. A large shop in Berne selling Vintage and modern clothes alters vintage dresses on a grand scale, because most clients want their skirts to end above the knee and not at mid-calf length. The vast majority of these altered dresses dates from the 80ies, but every now and then you see something older amongst them, too. This altering makes the dresses uninteresting for me (because I like my dresses to end below the knees), but it also means less and less dresses in their original state. Because of this I do not buy these altered dresses and I only buy dresses that fit me. Even if a little shortening or two centimetres less circumference would make them look perfect, usually I don’t buy them and hope they’ll find a more fitting client, in the truest sense of the word. But this spring another user of my favourite sewing board sold a beautiful late50ies/early 60ies wool shirt dress I wasn’t able to resist, despite it being too large and I threw all my priciples overboard. Because the sleeves and the bodice were made from one piece of fabric that made fitting issues at the shoulders nonexistant, this seemed to be a pretty easy one to be altered to fit me. And so I did. All I had to do was remove the skirt, shift the side seams to fit my size and re-attach the skirt. Because the wool was so easy to gather I didn’t even have to remodel the pleats. It was obvious that the skirt had been altered before, there were multiple seams in different threads at the waist. So I wasn’t the first to manipulate it and I was, I admit, a little relieved not to have destroyed something completely untouched (because of the thick fabric and the curved seam underneath the arms I had to cut away the fabric, too. I know, something you never ever should do, shame on me). Because one button was missing I had to remove the one at the bottom and sewed the buttonhole close so it would be less obvious. Grace to this fine striped pattern it works quite well. I added a small hook and eye to the waistband because the dress tended to gape, as there wasn’t a button to hold this narrowest part of the dress. It has been finished and in my wardrobe quite some time now and I love it. The hem looks a little pointy in the centre front, I think I will add a little press fastener to keep it in place. The fabric is, as you can imagine, quite scratchy, fortunately I own a shirt with the exact same sleeve length to wear underneath. Dear Ravna, thank you so very much for selling me something that has already become one of my favourite dresses! Usually there are two things that make it impossible for me to participate in the Me-Made-Mittwoch (= me made Wednesday, like me made may, but once a week): first,I forget it and only remember it took place when I read my blog feed the following morning. Second, even if I remember it I am not content with my outfit or do not wear anything selfmade that day. Miraculously today was a day were both premises met, so welcome to the first pure outfit post in months! Some readers may recognize the skirt, my version of a 1955/6-Lutterloh-Pattern. Yes, I was in a really good mood, although I had just come home from work. And no, I didn’t wear these shoes for work, but they look so much better than the burgundy loafers I wore during the day. One of my most worn wardrobe basics is my black half-circle-skirt. I made it in july 2012, inspired by a post on Casey’s Elegant musings. From its beginning it had a few flaws, the worst one a lack of fusible interfacing in the waistband (simply because I didn’t find it and was too eager to sew to search it). As for so many projects, I used the black fabric I originally had bought for my prom dress, with the wrong side out, because of that terribly shiny surface on the right side; you have seen it in my victorian sewing supplies box I showed you in january. Now, having worn the skirt everytime as soon as it re-entered my wardrobe after washing, it began to show signs of use, the fabric turned grey and to make things worse I managed to iron it too hot, leaving a shiny mark next to the back seam. I desperately had to sew to a successor! After consulting my patterns and sewing books and having considered what would be suitable for every day wear, I went for a 1955/56 Lutterloh-Pattern. I used the same fabric (but it was the rest, there nothing left of it, finally!) as for the old skirt, again with the wrong side out. For the back of the pocket and the waistband I used the right side, I don’t know if it is really visible in the photos (I have to excuse myself for the photos anyway, the camera settings were complete rubbish and I only noticed shortly before publishing this post, but I didn’t want to wait until I would be able to take new ones). the bright dot is the zipper’s slider. When looking closely at the shadow the pockets casts in the drawing, you could see that the two parts of the skirt should both form the pocket, creating a really large pocket. I decided against this, because I know me. Though I love pockets, I would have my hands in them all the time and I would carry around half my handbag in them. Instead I sewed the pocket’s rear piece, cut in one piece with the back of the skirt, directly onto the back of the pocket. The edge on the front part was finished with a wide facing and this facing I connected to the back of the pocket. This left me with a different pocket opening, the rear part lying flat and it left me with a very shallow pocket of maybe 5cm, enough to store some coins for the coffee-break, but not enough to hide my whole purse. The pattern didn’t include a waistband. So after I had sewn the rest of the skirt, all I had to do was to cut a strip of fabric as long as I wished (it could have been longer, though), enforce it with fusible interfacing (yes, this time I knew where it was!) and a strip of stiff upholstery fabric (because it is really wide and really tight-fitting, I shouldn’t eat too much wearing it). Because old Lutterloh-Patterns are not really made for cut-and-go-sewing I started this skirt working very fast and without any serging at all. After I saw that this skirt was really going to be a success, I finished all seams by hand with a red satin binding. The zipper is hand-inserted, too. The waistband closes with a skirt clasp and two small press fasteners. Normally official holidays aren’t something you are really aware of. When living in my hometown there were always those holidays who were only marked in the calender and the federal ones who meant a day off school. In this part of Germany, the 1st of November is a federal holiday, so of course Halloween was celebrated every single year since the 5th grade. Meanwhile I have moved to another country and to a protestant part of it. That means the 1st of november is a working day as every other day (except for the fact that all the people from catholic regions of Switzerland go shopping in Berne, so it is very crowded). For that reason a dear friend of mine had to plan her Halloween Party on Saturday, so please forgive that slightly belated costume post. As you can imagine, the last weeks weren’t the perfect time to prepare a perfect costume out of nothing, so I went for something already proved and tested. My grandmother, born in 1933, became a nurse after she had finished school. I don’t know exactly when she started her apprenticeship, but it must have been somewhen around 1950. What I can say fore sure is that she quit her job in 1965 when my father was born and she has been a stay-at-home-mum ever since, being at the age of 80 today. A few years ago she told me, that she still had her nurse’s uniforms in the basement. I was very exited and asked her to show it to me. In an old wardrobe she kept multiple of her dresses, aprons and other stuff. I was so very happy (also because my family isn’t very rich or aware of tradition and has only very few family heirlooms and souvenirs) and she asked if I wanted to have one of them. She gave me a dress, an apron, a cap, a surgical gown and even a matching brooch (well yes, the enamel is broken, I think she kept the intact one). The cap was a bit of a challenge, because she didn’t remember how it had to be folded. Looking at some photos at the internet and with a lot of trial-and-error experience I figured out something that could be at least a possibility of how it was worn, though I am still not sure if this is the right way. So, if you ever come across something that looks like a gigantic single layer slip, it is a nurse’s cap. It is starched very heavily, I didn’t dare to wash it until today because I am sure I will never be able to starch it as the hospital’s laundry did. The first thing you’ll need is something called nurse’s pins. I didn’t even know that they existed (having had always assumed that those caps had been pinned with standard pins) until a client of the haberdashery shop I used to work in asked for them (of course, we didn’t have them). But when I found a little box of white-headed pins in a sewing basket I bought on a flea market, I knew immediately what I had found. They are a little longer and stronger as standard pins and, as already meantioned, come only in white. First thing to do is fold the double-layered part of the cap back. Pin the ends together to form a circle. Pin the flap over the ends as shown. You can change the size by reducing or enlarging the overlap of the two ends and of the flap. Somebody at the party asked me if it was on purpose that I wore my apron inside out. But I didn’t. It has one pocket for the right hand on each side, so if it get’s dirty you can turn it around. For someone standing left from me it looks as if my pocket was on the wrong side of the apron. Me trying to make an ugly halloween-y face. And on the inside you can see a 50 year old (blood?) stain the laundry didn’t manage to eliminate. Puh, you know, I wanted to concentrate on my final exams taking place next week, I wanted to finish my 40ies coat to finally wear it this autumn, I wanted to prepare our household to move soon, I wanted to finish my Chiné-dress, I wanted to write a little more about different periods than mid-20th-century again….yes, I wanted, but did’t. Why? Because one of my favourite bloggers is hosting a Sew-Along. Tasha and Rochelle have just opened a Cotton-Vintage-Sew-Along. You can pick whatever fabric you like, as long as it is 100% cotton and sew a garment, as long as it is related to 1920ies to 70ies fashion. All participants share their progress in a Flickr-Group and show they finished projects in the end. 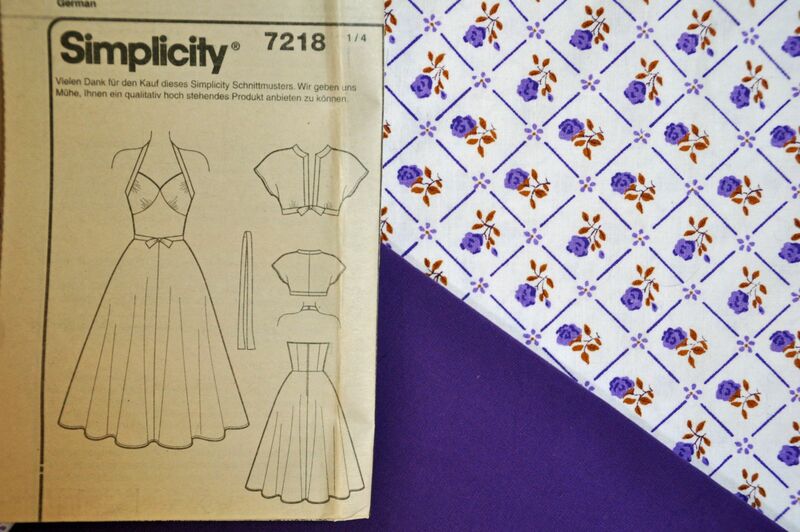 It was purely coincidental that I had already cut out a Reprint of a 1950ies Simplicity Pattern, consisting of a dress and a bolero. Unfortunately I don’t have the pattern envelope, but I found another blogger who made this dress and photographed it. A very heavy purple cotton and a vintage duvet cover, printed in purple and brown. The dress and the bands on the Jacket will be made from the patterned fabric, the bolero, the belt and the straps of the dress will be made from the purple fabric. I just hope it will work, the purple one is very stiff, I hope not too stiff to turn it into the bolero. As often, I won’t make a work in progress out of it. I will upload some photos into the Flickr-group if you want to keep up with my progress. But of course, I will show the finished garment here as well. Anybody who likes to join, too? I’m sorry for the lack of posts these days. It is so darn hot at the moment, I do not feel any urge to go outside. I am a spring and autumn lover, I hate hot weather, burning sun or getting a tan, I don’t even like to swim. But I am not in the mood of working at the sewing machine or the computer, either. Don’t ask me what I do the whole day, it is more existing than living. I am especially sorry, because I do have some finished projects to show you, I just have to manage to take some photos of them to present them here. In the meantime I will leave you with some photos my boyfriend made a few weeks ago, while we were picking strawberries. I wore my table-cloth-skirt and some new acquisitions I made at the Blutsgeschwister-Outlet in Weil am Rhein.